Our ever so elegant Country Gift Basket is a gorgeous gift that is perfect for all occasions. All the Summer goodies presented in a hand made country wicker basket! 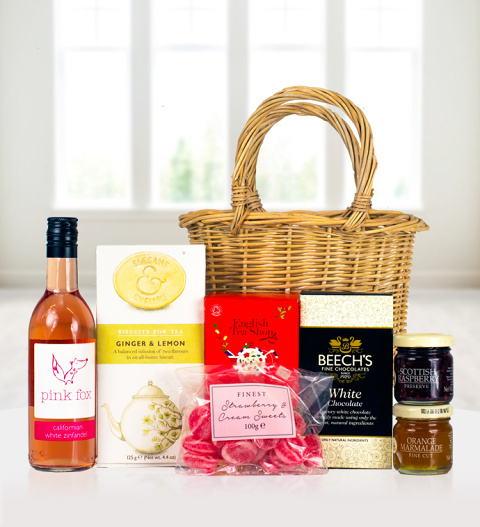 Included: Pink Fox Rose 187ml Beech's White Chocolate 60g English Tea Shop Spiced Red Fruits 16g Elegant and English Biscuits 125g Mrs Bridges Orange Marmalade 42g Mrs Bridges Raspberry Jam 42g Strawberry and Cream Pips Hand Made Wicker Basket. A marvelous basket that is available for UK next day delivery.